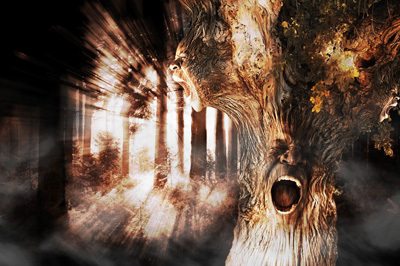 This tutorial shows how to montage human heads to a tree and to add in a dramatized effect. In a nutshell, it is done by applying various blend modes on the relevant layers, and simulating the tree texture using a simple combo of filters such as bas relief and zoom blur to achieve that extrusion effect. Open the images and drag them into the same working platform (tree layer). Click on the Pen Tool and start drawing paths around the head. CTRL+Click on the path drawn and click on the Masking Icon. Apply its Layer Mask when you are done. Note: To avoid losing the path drawn, always click on the new path icon and rename it accordingly i.e. ‘head front’ and head side’. As for the tree, I’ve decided to use Channel Masking. Duplicate Blue Channel, and adjust the level. Fill areas inside the tree with black, and brush the background (or unwanted areas) with white. Invert (Ctrl+I) ‘blue channel copy’. With the tree layer selected, CTRL+Click on its thumbnail and click the masking icon. I’ve further brush the leaves away on the left because thats where I’m planning to place one of my heads. We shall refer the layers as ‘head front’, ‘head side’, and ‘tree’ from now on. Disable ‘head side’ for now, as we will be working with ‘head front’. Duplicate ‘head front’ layer and hide the original ‘head front’. Blur the edges around the head using Zoom Blur Filter. 1.Add in Hue/Saturation adjustment layer and desaturate the color. 2.Next, add in Selective Color, select white and add an amount of black to reduce the highlight. Select selective color’s layer mask, and use a black brush to brush its teeth so that the teeth area remains unaffected. 3.Hold Alt and click the line between ‘head front copy’ and the adjustment layers to create aClipping Mask. This way, changes to the adjustment layers will only affect ‘head front copy’. The head seems to have sunk into the tree and start to lose its details. Reveal ‘head front’ (below ‘head front copy’) and set opacity to 50%. Mask some of the unwanted edges away with a soft brush. I’ve created a new empty layer and drew a Gradient in it (tree lighting layer). Change the blend mode to Softlight and set opacity to 50%. Clip it with ‘tree’ layer. That way the tree’s lighting would be more balanced, matching the face. Next, let details of the tree to creep in to the face and add in the necessary effects. For this, I’ve duplicated the ‘tree’ layer as ‘texture1’, and applied a Zoom Blur (of 55px) with the head as the center point of the blur filter. Then, apply Sketch > Bas & Relief Filter (Details:15 ; Smooth:2 ; Light:right). Note: The Zoom Blur filter is used to create a stretch effect and the Bas Relief filter to enhance the texture. Make sure the palette is set at default black and white (press D) when applying Bas & Relief filter. When it’s done, access Filter > Liquify window on ‘texture1’ and roughly bloat the area where the face would appear. Select Warp tool and squeeze the sides where bloating is done. This is to compress the edges of the face area with texture so it creates more depth. You might need to undo/re-do this step to grasp the head’s location correctly. Change the blend mode to soft light and start masking, revealing ‘texture 1’ at only around the head area (area in purple) and not the face area. I’ve also duplicated ‘texture1’ but only brush to further reveal a few strands of roots/veins-like texture. Hide the other layers accept for ‘tree’ and ‘head side’. Resize ‘head side’ to an appropriate size and place it at the side of the tree. Apply Zoom Blur at where you wish to blend (in this case, the back of the head), similar to how we did for ‘head front’. Select ‘tree’ layer and make a selection around ‘head side’. Duplicate the selection 2 times. Take one of the duplicated layer and apply a Spin Blur filter. Duplicate that spun layer. Transform the two spun objects and place it accordingly to create that curve on the forehead and neck. Combine the 2 spin-blurred layers as ‘curve’. At this point you might want to mask away unwanted areas that are deemed excessive. Duplicate ‘curve’ layer as ‘curve texture’ and apply Bas Relief (Details:15 ; Smooth:2 ; Light:right). Set soft light blend mode. Take the 2nd duplicated layer of the tree and rename it as ‘skin’. Liquify it so that it follows the shape of the stretch. Again, mask away unwanted areas and duplicate ‘skin’ as ‘skin texture’ when done. Bring the 2 layers forward (Ctrl+Shift+]) and set ‘skin’ blend mode as Lighten. As for ‘skin texture’, apply bas relief to it and set softlight blend mode. Reveal all the layers and you should get something like this. Merge the layers as one. You can further tweak your image for maximum effect. I’ve altered the color, saturation, and liquified the neck area to emphasize the stretchy feel. We are right about done for now but you might want to tweak the sharpness of each object to match one another. We can either use un-sharp mask filter, high-pass sharpening, or the sharpen tool. Lastly, I’ve dragged the tree into a new background, added simple fiery effects and smoke to create my final output. Here it is, and good luck everyone!